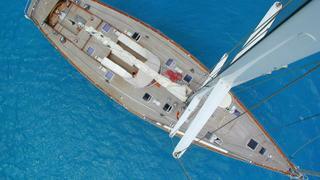 She was delivered in 1993 by Sangermanim and has been described by her broker as the “true definition of a classic boat”. Sparkman & Stephens were responsible for her naval architecture and exterior design and she features a hull made of wooden composite with a teak deck. She is one of only 17 projects designed by Sparkman & Stephens for the Italian shipyard. Sangermani was responsible for the interior on this yacht for sale, which features stylish Italian fittings with a classic feel combined with neutral colours. She offers accommodation for up to eight guests, with an en suite owner’s cabin and three double guest cabins with two heads. While a crew quarter contains three bunks with a bathroom and shower. Kim of Lahore offers plenty of space for relaxing on board and socialising with guests. Her well thought out layout means that she fell surprisingly spacious for a yacht of her size. One of her standout features is a large dinette which has a table that can sear up to 12 as well as comfortable sofas, two armchairs and a tea table. She also has a large separated galley. Powered by a Caterpillar 330hp diesel engine she offers a comfortable cruising speed of 10KN and a maximum speed of 11KN. Kim of Lahore is asking €1,000,000, with VAT paid.